Harder2Kill: Game Day. Game Plan. It's finally here! A day I've been waiting for since last year! I'm in Phoenix a day early to rest up before meeting up with the Project Athena crew tomorrow. Justifying the hotel's pool deck as heat training - has given me the luxury of time to think. I've been comparing my perspective from this year's R2R2R trek to the preparations for last year's. One benefit I have this year is the experience from last. So I'm already one up for myself in that regard. Last year I was excited, nervous and admittedly naive about what was in store for me. I was still cross-wired as to what I was trying to accomplish with my fitness goals. In fact this time last year - I doubt I would've used the term "fitness". I was still aiming to be thin. I was so focused on no longer being overweight and trying to attain a certain size. This time last year I was still using food as both reward and punishment for efforts instead of as fuel. I did take my training for last year's hike very seriously - but I made a few crucial mistakes. I had fixated all of my training on hitting distances and time. I was mainly only doing cardio to complement the hiking. This time last year - my motivation was an internal fear of not being able to stop a family cycle of poor health. This time last year - I was still apprehensive about meeting up with a group of strangers to do such a team effort. I just couldn't imagine feeling comfortable in the midst of strangers. The interesting thing about being in a situation where you have to depend on each other, you get past the "stranger" status very quickly. In a few hours I'll reunite with several of those same "strangers" that I now blessed to count as friends. There are quite a few of us returning for this year's hike. So a year later - am I a year wiser? I believe so. My stated goal for this year was to be stronger, suffer less and enjoy it more. So what is the difference? My focus this year has been on strength training at Capital City CrossFit and overall fitness that includes nutrition as a vital component. I now view food as fuel and have a better understanding on how certain foods help and hinder me. I know I'm stronger than I was last year. I'm banking on that strength to increase my endurance so that my body doesn't break down as quickly as it did last year. Last year when I was beginning to suffer - I was listening to about 20 people telling me to do about 30 different things. I was popping a variety of supplements, gu, magic water, sugar, grains, basically anything anyone handed me. All well-intended, but my mistake was not knowing how my body would react to certain things, or not knowing what my body needed at different times. I swelled like blow fish and suffered from extreme nausea. This year I have a clear nutrition plan - dried fruits, nuts, jerky, coconut chips will be used and the oreos, cornchips and fragile fruit will be left at home. I now know that grains, dairy, gluten and synthetic supplements like Gu doesn't make my body happy. Last year when we stopped to buy our trail food, I was literally buying anything that anyone else was buying - I had too much food, and I had tons of "wrong food" for me. This year, I'll talk and look around - but I'll do it while walking. I intend to make stops very minimal. 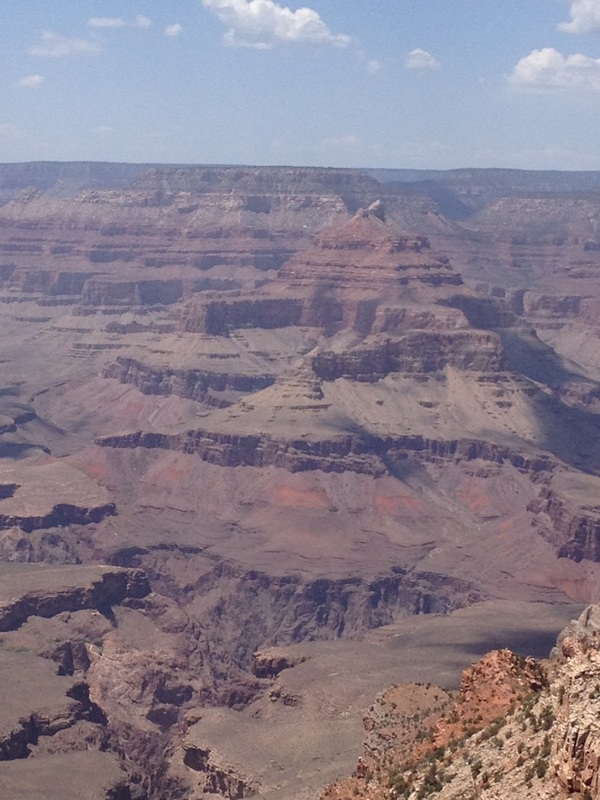 Let me restate that - I plan to hightail it like a scalded dog until I'm safely in the shade of the North Rim. Last year - as I was struggling - I was begging to stop and rest every few minutes. I understand now that frequent stopping is detrimental. My plan is to keep moving forward at every possible moment. Now I completely understand the lyrics of Rodney Atkins song, If your going through hell. In the song he sings of the need to just keep going - don't stop and if you are lucky you might get out before the devil knows you are there. I'm not sure of the background of this song or if Adkins is a fellow R2R2R trekker - but he certainly wrote the theme song for the effort. Last year I was on a personal journey to honor the loss of my father. And while that was my conscious goal - I believe I was really on a subconscious manic-quest to draw an imaginary line and end a family cycle of poor health and indifference. This year, my motivation is to be a stronger teammate, suffer less and enjoy the experience more.